Dr. Scot Hodkiewicz is a veterinarian who now has found his "Heaven". He lives with his wife, three kids, four dogs, two cats 15 miniature horses and various other animals on a 300 acre farm in southeastern Wisconsin. When not practicing, he denotes his time and skills to a Wildlife Hospital, local Humane Society and his church; all angels in his life. 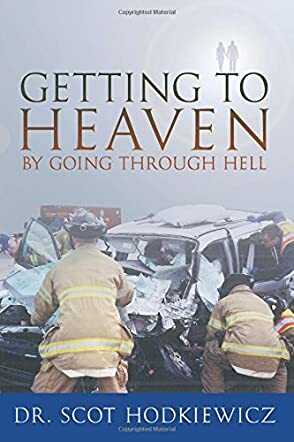 In an extremely inspirational and wonderful read by Dr. Scot Hodkiewicz, Getting to Heaven By Going Through Hell is a book that readers will not easily forget. Follow the true life story of Scot as he recovers from the effects of a horrific car accident caused by a drunk driver. Recounting his experiences with anger, despair, and addiction to pain medications after the accident had left his body mangled and his spirit shattered, this story is highly personal and emotional. When God finally breaks through to him, even in his very darkest times, the story takes a dramatic and wonderful turn, one that will keep readers rapidly turning the pages until they get to the very satisfying ending. I loved Getting to Heaven By Going Through Hell. Loved. It. How's that for a review? Author Dr. Scot Hodkiewicz has done a wonderful job in writing an extremely private story in such a way that offers hope and healing for many. This book brought tears to my eyes, not once or twice, but many times. It is written in a highly engaging manner and readers will find themselves loath to take a break from it. I am so pleased to highly recommend this book to any reader looking for an inspirational true story with a strong Christian focus. I wish the very best to author Dr. Scot Hodkiewicz and hope that he will consider writing another book in the very near future. If it's anything like this one, it will certainly be a must-read! Most of us gain knowledge through our own experiences. The wisest among us learn from the experiences of others. Dr. Scot's remarkable and difficult journey provides a vivid account of how this family's unfailing faith in God helped them overcome a devastating event and foster a powerful spiritual awakening. Unfortunately for most of us, we don't really appreciate what we have in our life until it is taken away. Following a cyclical pattern of blessed happiness followed by simple apathy, complacence and sometimes pride, most of us often take for granted the truly amazing blessings and privileges in our lives. That is, until disaster strikes and we lose those things. What often follows is a painful and humbling realization and awareness of the external, and often unrecognized and unappreciated, forces in our lives. Be it God, family, friendships, etc., it is only by humbly recognizing and re-evaluating our true priorities that we find ourselves once again in a position of happiness. This is Dr. Scot's story. Fast paced and often humorous, you will have a hard time putting this book down. This book is a true inspiration and a clarion call for all of us to re-examine our priorities and make the important things important. Highly recommended!